This is a story about a New York Times columnist who dissembled, a movie about a man named Truman who escapes from a made-up reality, and Israeli Arab villagers who stood by helplessly as the Israeli army destroyed their village. The New York Times’ column (August 2) strains credulity. Some of my best liberal friends were taken in by the earnest, helpful tone of the column written by Efraim Karsh. Unless you are well versed in the history and politics of the Middle East, circa 1948 to the present, you too, might read Karsh’s column as a serious effort to be helpful to the Palestinian people. Efraim Karsh is an Israeli-born professor of Middle East and Mediterranean studies at King’s College London and the author, most recently, of Palestine Betrayed, a book praised by a certain segment of the American media/academic community. For the past week I have been reading and writing about, Andrew J. Bacevich’s book, Washington Rules, a clarion call which alerts the American and Israeli publics to the reality that we are all living in a reality show created and sustained by Washington Rules. Bacevich makes a convincing case that our American power matrix operates within an interlocking control mechanism which demands decision-making consistency from all who seek the comfort and security of believing in the Rules. This matrix controls our understanding of reality in a manner disturbingly like the enclosed community created by film director Peter Weir in his brilliant 1998 fantasy movie, The Truman Show. In that film, insurance salesman/adjuster Truman Burbank (Jim Carrey) has lived his entire life within a totally fabricated television reality show. Karsh and the New York Times know that under the Washington Rules, the American public receives its information on the politics of the Middle East from the keepers of the Washington Rules. Experience teaches us that this is how the Zionist narrative will continue to be viewed. There are signs, however, that this could be changing. At a crucial turning point in The Truman Show, Christof, the director within the film, realizes that Truman, is starting to doubt what he is experiencing. Christof is forced to tell Truman the truth. In doing so, he argues that it is a better truth than the one Truman would find if he escapes from the world Christof has created for him. The Zionist narrative, with its elements of horrific reality, has been stretched so thinly by the current right wing Israeli government that its credibility has begun to crumble. In time, even the casual observer may begin to doubt. Karsh and the Times are doing their part to protect the narrative, presenting Israeli leaders as well-intentioned Zionists who really can be trusted to do what is best for all. Karsh does not help his cause by misusing a survey conducted by the Al Arabiya television network to argue that the “Arabs have indeed abandoned the Palestinians”. The sooner the Palestinians recognize that their cause is theirs alone, the sooner they are likely to make peace with the existence of the State of Israel and to understand the need for a negotiated settlement. Start with a false premise, you reach a false conclusion. The Al Arabiya survey did not mention Palestine nor Palestinians. Rather it asked respondents about their level of interest in the “Middle East peace process”, a vague question to which 71 percent responded they had no interest. Given the lack of results and the repeated disappointments and frustrations experienced during just the last two decades of the so-called “Middle East peace process,” this lack of interest displayed by respondents in the al Arabiya website question is hardly surprising. But to go from this result to Qallab’s alarming conclusion or Karsh’s broader argument is both unwarranted and dangerously wrong. The American public which lives under the Washington Rules, continues to close its collective minds to the harshness of what has happened to the Palestinian population since the start of the Nakba in 1947-48, an event which Karsh in an earlier book, denied ever happened. The power centers that enforce and sustain the Washington Rules work diligently across partisan political, media, and financial lines to keep the masses living within a reality show, never fully informed and always just out of sight of the brutalities of Israel’s ever-expanding military control. He asks Palestinians to reach a negotiated settlement with an Israel he denies was created through an ethnic cleaning of Palestinian families that continues unabated to this day as the picture above and this video demonstrate. Should the Palestinians negotiate in good faith with a government that has just bused in high school students to take part in the most recent ethnic cleansing of its own Israeli residents of the Bedouin village of Al-Araqeeb, ancestral land that has belonged to these Bedouin families since the Days of the Ottoman Empire? On July 26, Israeli police demolished 45 buildings in the unrecognized Bedouin village of al-Arakib, razing the entire village to the ground to make way for a Jewish National Fund forest. The destruction was part of a larger project to force the Bedouin community of the Negev away from their ancestral lands and into seven Indian reservation-style communities the Israeli government has constructed for them. The land will then be open for Jewish settlers, including young couples in the army and those who may someday be evacuated from the West Bank after a peace treaty is signed. For now, the Israeli government intends to uproot as many villages as possible and erase them from the map by establishing “facts on the ground” in the form of JNF forests. Do Efraim Karsh, the New York Times and the keepers of the Washington Rules really expect us to believe the Palestinian people can trust this current Israeli government? Apparently they do, which just may be a hopeful sign because the world of unreality they have created is showing signs that its days-or years-are numbered. 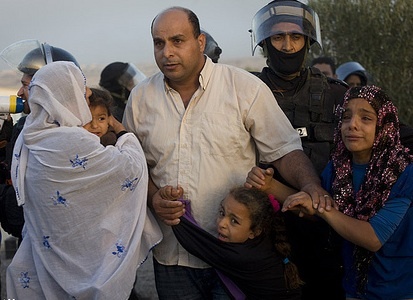 The picture is an Active Stills photo of a Bedouin family being evicted from their home in Al-Arakib. The still photo and the video at top are from maxblumenthal.com. Thank you for a most timely, hard-hitting article. Your efforts and caring are invaluable. Jim, One sign that the tide of public opinion is turning is the news that Interfaith Peace Initiative’s July report of Global Actions to End Israel’s Occupation doubled in size after the Flotilla disaster with news of action by businesses, governments, labor unions, religious & consumer organizations. See http://www.interfaithpeaceinitiative.com/globalactions.pdf. Ehpraim Karsh’s asks “What, then, are we to make of a recent survey…finding…71 percent of the Arabic respondents have no interest in the Palestinian-Israeli peace talks.” [8-1 “The Palestinians, Alone” ]. My interpretation of the survey results differ greatly from Karsh’s. To those who know that a viable Palestinian state is impossible unless there’s at minimum a permanent settlement freeze, the “peace” talks are merely more stalling while Israel engages in its p-i-e-c-e plan – its ongoing annexation of Palestinian land. Israel’s illegal settlement network already consumes 42% of the West Bank, says Israeli human rights organization B’Tselem in its “By Hook or by Crook” report. The sham peace talks are likely to be another drawn out process for again offering Palestinians several disconnected bantustans and permanent subjugation, like the fake “state” offered to South African blacks. Peacework should start with holding Israel accountable to international law. Palestinians are fully aware that they fight their battles alone amidst neighboring Arab nations. Many Israeli (Jewish) citizens I encountered while living and writing in Jerusalem argued that the Jews “needed” Israel, while the Palestinians were welcome to become citizens of any Arab state. The Palestinians have no other home, much as the children of the holocaust (a Facebook group to which you belong), felt they had nowhere else to go. The 6 million Palestinian refugees, displaced after 1948, now residing in Lebanon, Jordan, Egypt and other states around the world have no civil rights. In Lebanon they, nor their descendants, are permitted to own land or even to become doctors and lawyers. I find it disturbing, at best, that someone who subscribes to “The Institute for Zionist Strategies, Jewish Ideas Daily and the Jewish Review of Books,” to write such a misleading article for the New York Times without discussing his political leanings. Your biography clearly states, your status as a professor of Middle Eastern studies at King’s College London, and authorship of “Palestine Betrayed,” leading your readers to believe that you must indeed have Palestinian interests, or at least knowledge, in mind. What you wrote was the “long conventional wisdom,” of the Zionist movement in Israel, not the “conventional wisdom,” of those whom you write about nor those who are truly educated regarding Palestinian relations with the rest of the Arab world. The last line of your article, “The sooner the Palestinians recognize that their cause is theirs alone, the sooner they are likely to make peace with the existence of the State of Israel and to understand the need for a negotiated settlement,” is not only forthrightly Zionist, but also incorrect. The Palestinians recognize that they are alone in “their cause,” [which I must assume means to return to their homes and receive justice for the incessant breeches of international law they face from the occupying force of Israel], but you make no argument as to how that recognition would pre-empt a recognition for the existence of the State of Israel. Not to mention, the “staggering 71-percent” of Arabs who are no longer interested in peace talks is not so “staggering” after all. What percentage of the Palestinian population is interested in more talks? How is it staggering that no one is interested in an on-going process which produces no results? I’m glad I did my research on you and your background Mr. Karsh. I only wish you would be more open about your zionist-leanings in your editorial, so your readers could appreciate your credibility on the matter of ‘what Palestinians should be doing,’ for themselves. The column written by Efraim Karsh is indeed so dissapointing. Thank you, again, for your insigntul column. One can only hope that our President is aware of this story that has for so long been played out. My thanks again for your persistance in airing of these truths. Let us hope that our President and Members of Congress are increasingly aware aware of what is happening. Harris Fawell. Jim, thanks again for your usual insightful commentaries on things Middle East. From history and my own personal experience (over the past fifty years) of the Israeli/Palestine issue, I have learned that one cannot trust anything the Zionists say. Our government knows that and it doesn’t bother them one iota. It shows that Washington Rules is the game and one either shuts up or tells the truth. And this is American democracy?